The RoadBet was established in 2012. It is a British company registered and licensed in Malta. The address is Road Bet Ltd, Block A, Suite 3, 179, Skyway Offices, Marina street, Pieta, PTA 9042 Malta. The company is quite popular among gamblers because of a specific feature – it accepts payments with bitcoins and Perfect Money. In fact, RoadBet employs a unique bookmaking approach that you probably wouldn’t find with the other online bookmakers from the industry. The sports betting provider assures its client that the low margin-high volume that it offers is giving the bettors not only great odds, but also increased limits. It is surely a young player in the rough bookmaking branch, but RoadBet is proving so far to be a solid and financially stable company. The online bookie looks like a promising choice for every type of gambler – experienced or newbie. The management behind this bookmaker is has a strong knowledge of the industry and perfect first-hand experience. The betting markets offered on the website are many. 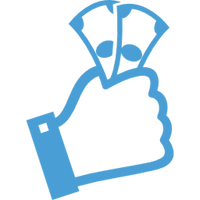 Thank to the big variety many gamblers prefer the online bookie over others, more famous and better established names in the industry. There are numerous sports to bet on, so most bettors will be very happy with the market offering. Being relevantly small and new to the market, the online sports bookmaker does not offer casino and other games such as poker. The company is mainly focused on sports events and it’s entire platform is created around the idea of easy, simple and profitable betting from home. That idea is well implemented by the management of the online bookmaker by supporting live statistics and information about different sports events. As live streaming isn’t an option, all clients can follow the statistics which should allow them to have good idea of what and when is happening and where should they bet. That not only eases the bettors but increases their chances of winning by keeping them well informed. 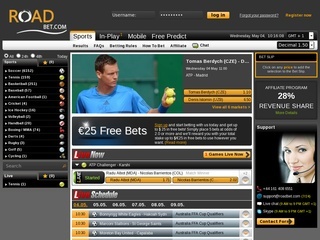 Roadbet offers great options to bet. 1×2 – a standard option which has three different varieties – home win, draw or away win. Double Chance – It is a way of betting on football matches where any client can bet on two out of three possible outcome for a particular match. This increases the chances of winning dramatically. Draw no bet- here the bettor should predict the winner team and if the match ends in draw, the stakes are refunded. Half Time – these are bets made on the result only for the first half time. Even in a case of abandoning the match during the second half, the bets are valid. Asian Handicap – a specific type of handicap specially created and designed for soccer matches. There are several varieties for the Asian handicap – Asian handicap 0.5, 0.75, 1, -0.25, -0.5, -1. In-play Asian Handicap – people bet on the score from the moment when the bet was made till the end of the match. 1st Half Asian handicap – bets are made only during the first half and if the match is suspended or aborted after that moment all bets are valid. Over/Under – a way of betting aiming the bettor to predict the exact number of goals during the match. The options are under 2; 2.25; 2.5; 2.75 and under 2; 2.25; 2.5; 2.75. 1st Half Over/Under, Odd/even, Correct score, half-time/full-time, first team to score/last team to score, total number of goals, winning margin, first, last, anytime goal scorer, both teams to score, to score both halves, to win both halves, to win either half, to win to nil, half with most corners, time of 1st goal, highest scoring half, penalty awarded, first goal method, winning method, race to 2 goals/3 goals, kick off, group winner/qualify/forecast, top 4, 6, 10 etc. Finish, to be relegated, outright winner. The bookmaker tries hard to keep all data and user related information protected. There are two levels of protection inside and outside. The protecting from influencers coming from the outside consist of passwords and unique username which only the customer knows. On top, all data is stored on well protected servers. The inside layer of protection is related to roadbet employees who sign the terms of policy and agree to keep all the information they have strictly confidential. The online bookie offers several contact options – via phone, email, live chat, skype and contact form. The communication is in English and this is the only language the website offers. There are a few ways to make deposits in RoadBet. Every client can use bitcoins, perfect money, payeer. There are more options for withdraws however. The bettors can take advantage of many payment options. Except for the virtual currencies, which are something very specific and rare for the world of gambling, the online sports bookmaker uses USD and EUR for payments. Usually the currency used for making the deposit is the same the client gets the withdraw. Some payment options are processed immediately like Webmoney USD, Perfect Money USD and EUR, Payeer EUR. Some of these have minimum deposit of 1 USD and others of 0.1 USD or respectively EUR. In the same time, some methods take 6 hours and cost up to 10 USD to process. These are BTC-E USD and EUR. Withdraws on the other hand take from 24 hours to none according to the specific payment option. Deposit bonuses and loyalty programs are not offered by Roadbet. However, the company hosts a game called “free predict” with virtual money but the top three players get 100 USD at the end of the month after which the game starts again.